This is the scrappiest pillow in scrap town. The fabric is scraps. The binding is scraps. And let me just tell you about the batting. 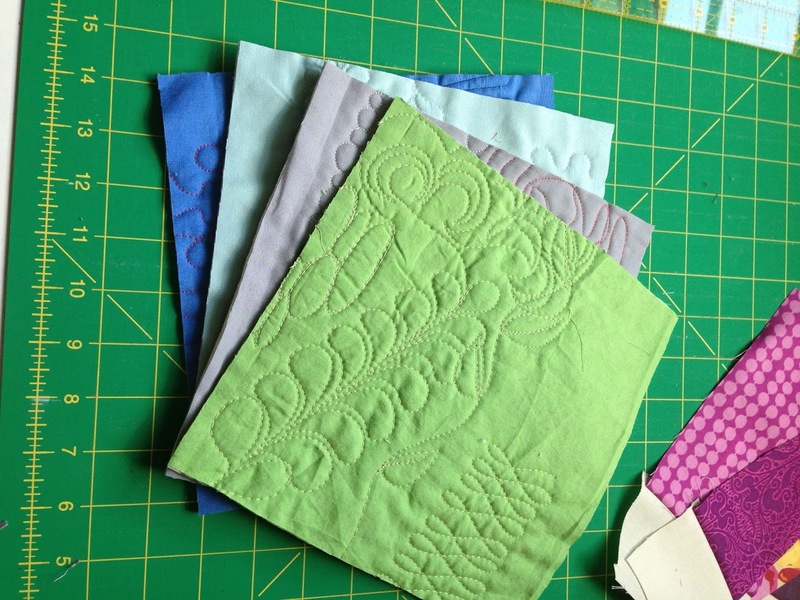 If you do free motion quilting you probably have a little collection of practice pads for testing designs or tension. I finally lit on a worthwhile use for these ugly things: foundation piecing. I cut four squares, started with a scrap in one corner, and did sew and flip for a quarter-log-cabin block. After making and trimming and joining four of them I had a foundation pieced pillow that just needed a backing and a binding. No quilting necessary, since it was pre-quilted! I always feel happy when I find a worthwhile use for something that seemed unusable. As I was attaching the binding my daughter asked "Who is that for? Is it for me?!" Such a joy and a surprise to find her excited about something I made. So while it had been destined for the couch, it is cradling a cutie with gorgeous ringlets these nights. I assure you the rest of her room is a right mess. But it's my blog and I want to show the pretty parts of my life. I do think the couch will get one eventually. I have a lot of practice pads! OMG! Brilliant. I will be trying your idea for sure. I have a ton of FMQ practice pieces that need to be dealt with. Your daughter has good taste! The pillow is wonderful and looks so lovely on her bed. The quilt is amazing too! what a great idea! I will have to pull out my practice pads and see if any are big enough to use for something like this. That is a great idea. 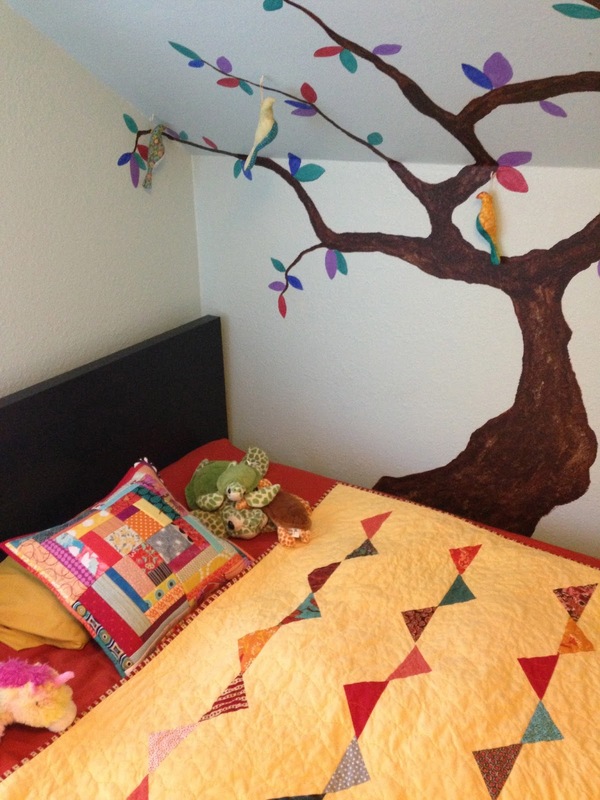 And I love that tree in your daughter's room - so cute!! Super idea! I've always got bits of things hanging around. It's a good way to use things up. It obviously appeals to a very discerning audience. THAT IS SUCH A GREAT IDEA!!!! Sorry didnt mean to yell. I have huge stack of those babies with the ugliest fabs you can imagine. I am going to try it. Very clever,unique, thrifty, and most all cute. I've never thought of that! I have plenty of practice pieces to use too! Such a nice idea! Oh and I totally love the tree in the room! Picking ideas for mi 15 month boy's room. Thanks for sharing! Brilliant idea, lovely cushion, fantastic bedroom! I like the pillow a lot and think is is great on that bed! Fabulous idea! I've just been cutting them up and adding them as stuffing to the pillows I make for the animals at the SPCA but I am liking this idea too! A smashing pillow and a magical bedroom too! That's awesome. I love that idea. Your pillow is great, and I know just how it feels when the daughter asks that question. I had to crack up when you said that about the house being a mess. Truth be told, sometimes I can't blog, because I can't get a photo taken. And sometimes, I can't get the photo taken because I cannot find one corner in my house from which to take the photo where you don't see a mess behind it. Kind of embarrassing! Love it, Christina. It's the perfect recycle. love the pillow and using up stuff. I will be in Portland in September. Can you recommend a good value hotel or well located motel? Awesome idea! What better way to be reusable. Great pillow! Love the idea of conserving by reusing. Oh she must have the sweetest dreams sleeping in that adorable room! Cute pillow, great idea! Smart! I have a lot of those practice pads too! 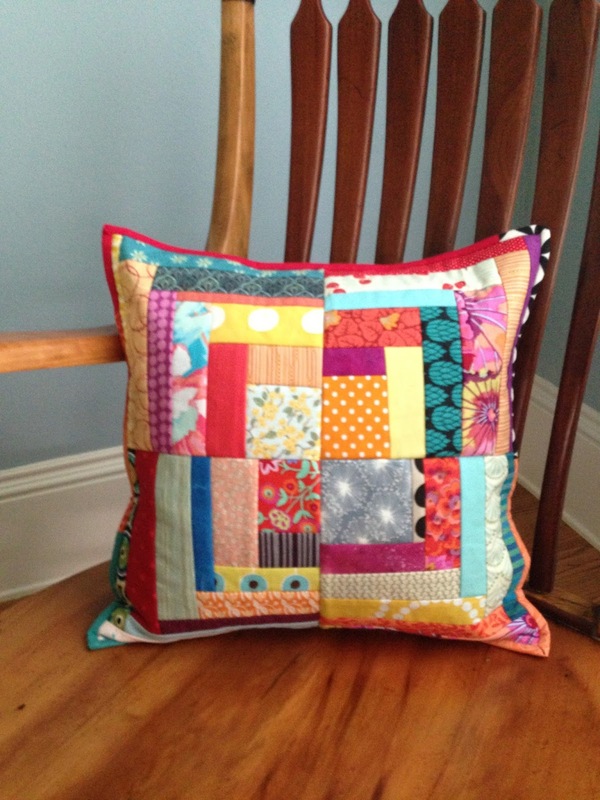 I really love this pillow made of scraps, and you had such a great idea using your quilting practice pads! IWOW I'm not the only one whose daughter doesn't appreciate her mum's patchwork pieces!!! Great idea of using those pads!